An area on mt. 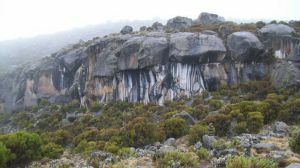 Kilimanjaro that is used as overnight accommodation for climbers on the Marangu route. 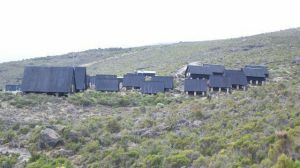 It is the first campsite encountered along the route and also one of the few that has cabin accommodation in the form of wooden - A shaped huts, capable of housing 6 to 8 people each to give a total capacity of about 60 climbers. It also has a mess hall where meals are taken and a ranger's/administration office where all people arriving or leaving the camps are required to register. There are no bathroom en-suite rooms are available, the toilets at the campsite are shared W.C.s located at the middle of the camp — some of the few available on the whole mountain (others being pit latrines). 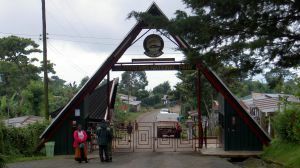 The camp is exclusively used by ascending climbers on the Marangu route, as most descending climbers opt to pass through the camp and continue to the park gates/exit. The campsite also has a steady supply of water that is supplied by one of the streams on the mountain. MAndara huts also has a separate house for porters and guides. Mandara huts is in Kilimanjaro's montane forest, surrounded by trees and the never ending chatter of animals and birds. However, after a few minutes walk up the mountain, the edge of the forest reveals itself as the heather region begins. Also about 1km up the mountain is Maundi crater, that offers a good view of the mountain peak and the rain forest below. This would be a good place to go on the day you arrive at the campsite, usually the first day of the climb. The campsite's is on the southern side of the mountain, about a 3 hours walk from the entrance. The forest is usually area is not as cold as the rest of the mountain, so most people wear light clothing. However, there is plenty of rainfall and the pathways in the area are almost always wet and slightly slippery. The next campsite after this is Horombo huts where as the previous destination is Marangu gate. Are you associated with Mandara Huts campsite? Contact us to improve this page or create another page for your business.